可算名詞 [食べ物には 不可算名詞] イチゴ 《実》. From Middle English strawbery, strauberi, from 古期英語 strēawberiġe, corresponding to straw +‎ berry. The word for straw was derived from a verbal participle and thus meant "(that which is) strewn", hence the applicability to berries growing on a bush. The sweet, usually red, edible fruit of certain plants of the genus Fragaria. Any plant of the genus Fragaria (that bears such fruit). She has the best strawberry patch I've ever seen. A dark pinkish red colour, like that of the fruit; strawberry red. (まれに) Something resembling a strawberry, especially a reddish bruise or birthmark. Containing or having the flavor of strawberries. I'd like a large strawberry shake. Flavored with ethyl methylphenylglycidate, an artificial compound which is said to resemble the taste of strawberries. 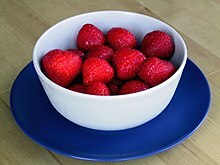 Of a color similar to ripened strawberries. The strawberry lipstick makes her look younger.